Oregon State University doctoral student Hankyu Kim sets up a decoy of a hermit warbler. Songbird populations have been declining, and rising temperatures are one reason. Nearly all birds are “canaries in the coal mine,” in the sense that when they’re in trouble from habitat destruction, rising temperatures, pollutants, and so on, they’re heralding trouble for all species, including the human one. For that reason, among many others, I love to hear of efforts to protect even one kind of bird. Consider this story by reporter Jes Burns at National Public Radio (NPR). “Each spring, songbirds migrate thousands of miles to breed in Oregon’s Cascade Mountains. Deep in a forest, Oregon State University researcher Hankyu Kim feels he has gotten inside the head of one species, the hermit warbler. ” ‘These birds are territorial in the breeding ground, they set up their territories, and they fight with each other to defend it,’ he says. 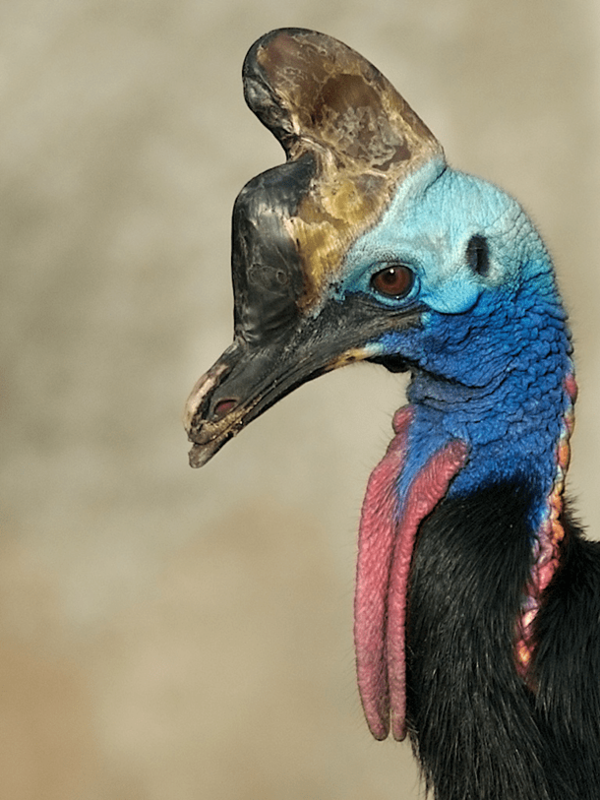 “Rising temperatures can shrink where some birds can live and where they can find food. For the hermit warbler, those declines are up to 4 percent each year. “Research by Oregon State’s Betts and Sarah Frey found warblers declined in areas with young forests, including those replanted after clear-cut logging. But hermit warblers are doing better in other areas. ” ‘In landscapes that had more older forest, their population declines were lowered, or even reversed, even though the climate has been warming,’ Frey says. “The Pacific Northwest has had a decades-long push to preserve its old-growth forests, and the warblers thrived in them. That suggests these forests somehow shielded them from the ill effects of rising temperatures. The question is why, and that is where this new study comes in. “They walk down a drainage though a 50-year-old tree plantation, a remnant of the logging past at the H.J. Andrews Experimental Forest. Then they cross into a grove of much older trees, some close to 300 years old. “Hadley explains that the temperatures can be different at various heights of a tree. ‘It’s possible that when it’s warmer, [songbirds] may be only using the bottom and more shady parts of the trees,’ he says. He guesses they may move up higher when it becomes cooler. More. This seems like an extra reason to protect old-growth forests, not just replant after logging. But how long will five degrees cooler be enough? Kim, do you know about this? And are you seeing these warblers at your banding station? Oregon State scientists are tagging and tracking hermit warblers in hopes of learning why their numbers have stabilized in places with old-growth forests, despite declines in other areas. Sometimes when I’m trying to cross a city street in traffic that’s coming from all directions, I think about how people who don’t visit cities much — Inuit people, say, or rural tribesmen in Africa — would cope. Probably about as well as I would cope dealing with the habits of lions or polar bears. We all develop the survival skills we need most. Birds do, too. According to Scientific American, urban birds develop skills that let them outwit their country cousins on certain tests. Christopher Intagliata reports,”While visiting Barbados, McGill University neurobiologist Jean-Nicolas Audet noticed that local bullfinches were accomplished thieves. “So Audet and his McGill colleagues captured Barbados bullfinches, both in the island’s towns and out in the countryside. They then administered the bird equivalent of personality and IQ tests: assessing traits like boldness and fear, or timing how quickly the finches could open a puzzle box full of seeds. “And it turns out the city birds really could solve puzzles faster. They were bolder, too, except when it came to dealing with new objects—perhaps assuming, unlike their more naive country cousins, that new things can either mean reward … or danger. I love thinking about sunlight and shadow. Dickens uses them a lot for Richard and Ada’s story in Bleak House — maybe my favorite book of all time. Many of you know what the decades-long case of Jarndyce vs Jarndyce did to Richard and Ada’s bright hopes. I’ve come to think that it was not so much Richard’s fevered expectations of an inheritance that brought the most sorrow, but his need to fix blame. Blame is corrosive. When I interviewed a formerly homeless Marine last week and he started telling me about how upset he was that something bad had just happened with his benefits, I was touched by how he kept reminding himself how to cope, saying, “I believe in fixing the problem — not the blame.” Words to live by. Starlings swarm in flash mobs over Scotland every November and February, and they don’t even need social media to remind them it’s time. According to an article at the BBC, “Tens of thousands of the birds are regularly seen around this time of year near the Dumfries and Galloway town. It is one of the most famous locations for the natural spectacle, the reason for which is not definitively known. “A survey of the birds across the UK is currently under way with members of the public urged to record sightings. The poll, conducted by the University of Gloucestershire and the Society of Biology, is the first of its kind and has already received more than 600 reports from Cornwall to John O’Groats. 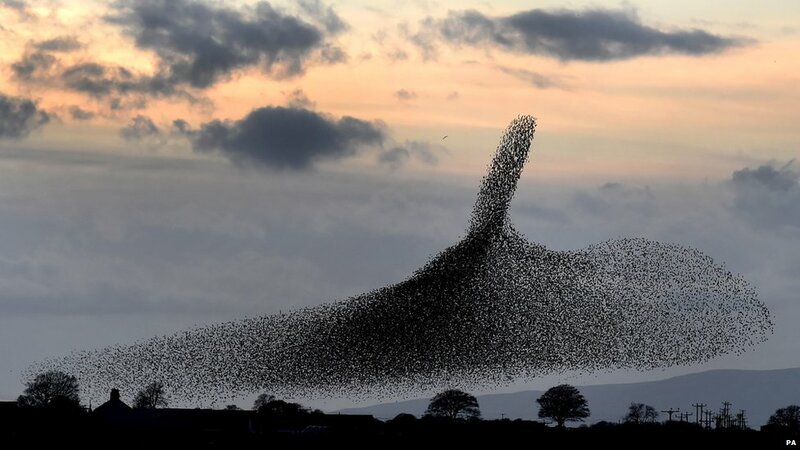 “Dr Anne Goodenough, reader in applied ecology at Gloucestershire University, said: ‘One of the theories behind the murmurations is that it means they are safer from predators such as hawks and falcons. More here. Don’t miss the other amazing photos at the BBC site.